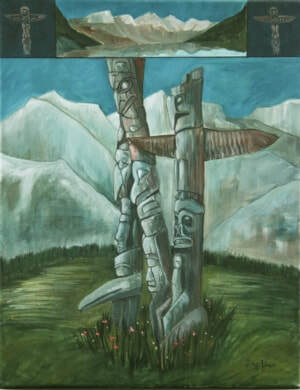 The totem pole is a monument created by Northwest Coast indigenous people to serve in various ceremonies. It also serves as a genealogical record sign board. These totem poles are carved out of cedar trees and painted with bright colours. Completed totem poles are usually erected as part of a ceremony and depict crest animals that are property of specific family roots and reflect history of the ancestors. The crest animals represent kinship, group membership and identity while the rest of the pole may represent a family’s history.